In the 1990s, a well-known retail axiom in China was: "With department stores, look to Sogo, with supermarkets, look to RT-Mart." As of recently, however, the king of the Taiwanese-financed department stores in China is not the widely emulated Pacific Sogo; nor is it one of the other two Taiwanese department store titans, Far Eastern or Shin Kong Mitsukoshi. It is instead Grand Ocean Department Stores, a virtual unknown in Taiwan that is a cross-investment subsidiary of shipping firm First Steamship Co. Yet its 2011 sales of NT$25.8 billion and after-tax profit of NT$845 million placed Grand Ocean Department Stores fourth among this year's CommonWealth Magazine Top 500 Taiwanese service enterprises, closely trailing Far Eastern, Shin Kong Mitsukoshi and Pacific Sogo. Moreover, in China, Grand Ocean is currently the biggest Taiwanese department store chain of them all, with 18 locations. The inspiration who almost single-handedly created the Grand Ocean legend is 46 year-old Yan Si-wen. Although leading the Grand Ocean Department Store Group into just its tenth year, its chairman and CEO has been kicking around in the department store business for more than two decades. Yan's first job after his discharge from the military was at Pacific Sogo's Fengyuan store in Taichung County. 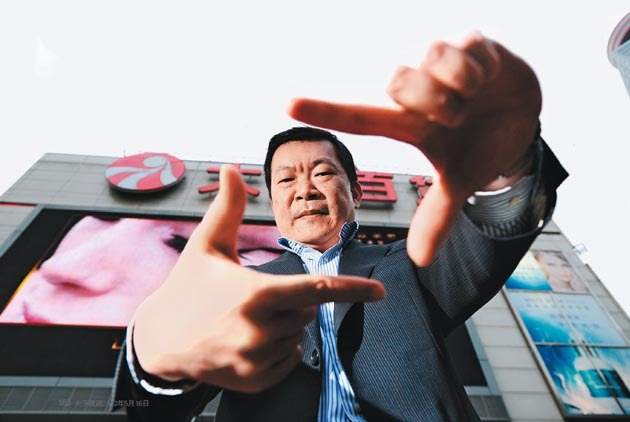 When Pacific Sogo entered China in 1996, Yan was part of the advance team that worked to set up new Sogo branches in Shanghai's Xuhui area and in Chengdu, Sichuan Province. These experiences would prove to be the foundational key to what would become today's Grand Ocean operations in China. Born and raised in a small fishing village in Tainan, the formidable character he presents is not exactly the slick talker so often seen in the department store business. Not only is he a man of few words, but those he does utter are also delivered in a low, deep voice that borders on the folksy. Yet when the conversation turns to the department store business, he immediately becomes animated, speaking with poise and self-confidence. One thing he has learned is, "In the department store business, there is no secret other than diligence. It takes years of planning and preparation, like practicing hundreds of free throws every night, all to be able to sink that shot the next day." In 2002 Pacific Sogo's China development plans came grinding to a halt as its parent company, Pacific Construction Co., Ltd., became mired in financial crisis. It was then that Yan decided to form his own company, taking a group of less than a dozen Sogo executives with him. His Sogo pedigree made Yan's start-up a success right from the start. Although just 36 years-old, due to his ample experience in the trenches and possession of rich, well-rounded leadership qualities, he and his team were able to employ a strategy of "Sogo cloning" and "besieging the cities from the countryside" to rack up five new store openings in just eight months. Strong backing from suppliers also meant that Yan was able to rapidly duplicate Sogo's product lines. He constantly warned his procurement executives that they must consider things from the perspective of the suppliers and must never approach them with a one-size-fits-all, institutional mentality. As such, when news that Yan was setting up his own venture got out, suppliers were lining up at his door. As he recalled the "wherever you go, we're behind you" reaction of suppliers clued into his new venture, Yan's tone reaches a crescendo. Armed with such professionalism and focus, Yan had few difficulties securing seed capital. "Talk need only turn toward the department store business and Chairman Yan will take great delight in the conversation; on other matters he can be quite taciturn," says Daniel Dai, former chief financial officer for First Steamship and now executive director of Grand Ocean. One can rest easy handing over money to such a top flight executive, Dai says. After a mutual friend introduced Dai to Yan in 2004 and after getting to know Yan, Dai recommended that First Steamship invest in Grand Ocean. First Steamship continued to increase its stake in Grand Ocean after Dalian Wanda Commercial Properties, Ltd., originally Grand Ocean's largest shareholder, pulled out, and now holds a controlling 52.2 percent stake in the company. Now the precocious child has eclipsed the parent company with the "golden goose" Grand Ocean last year accounting for 95 percent of First Steamship operating revenue. That Grand Ocean was able to effortlessly attain the capital threshold for opening a department store was largely attributable to the cost environment at the time. Opening a standard 40,000 square meter department store today, for example, would cost about 40 million renminbi, or about 1,000 renminbi per square meter. Ten years ago, however, store opening costs were only about 300 renminbi per square meter. After switching career tracks Yan has been relentless in pursuing his business objectives, but his blind adoption of replication tactics previously gave him a taste of misfortune. As he recalls, failure to allow time for acclimatization amidst a spate of rapid store expansion led to a period of sluggish sales at Grand Ocean. Citing as an example Grand Ocean's Nanjing store, the sales leader among the chain's 18 stores with average daily sales of 3 million renminbi, Yan says on the store's opening day in 2003, sales were a paltry 170,000 renminbi. That same year the SARS outbreak and government macroeconomic policy tinkering was having a massive impact on the economy, but as Yan painfully recalls, slowing the pace of store openings gave him time to come to the realization that the tastes of Shanghai residents did not necessarily dovetail with other areas. He then made a crucial decision, shifting away from centralized policy planning and giving greater decision-making authority to local store managers. One example is "product rollover," when department stores periodically replace their product lines. According to one local investment consultant who has long been a keen observer of the cross-strait department store business, Grand Ocean has always been able to discern the demands of local consumers whenever it opens a store in a new city and even to avoid being squeezed by competitors. The secret to its success has been its uncanny abilities in executing product line rollover. Each Grand Ocean store conducts two product line rollovers annually. Lai Jianwen, general manager of Grand Ocean's Nanjing store, says his store stocks 618 different brands and despite being in operation for nine years, 170 brands were shown the door during a product rollover conducted in February. "Consumer tastes are forever changing, and the value we provide must naturally keep pace," Lai says. Grand Ocean even has a secret weapon in overseeing the abilities of each store in executing product line rollovers. Early on the morning of April 29, the first day of China's Mayday holiday weekend, dozens of fashionably dressed young people were lined up outside Grand Ocean's red hot Xinjiekou store in central Nanjing before the store had even opened. They sat and stood about in groups of twos and threes, chatting as they waited for the store to open. Compared with the dearth of activity outside the closed steel security gates covering the display windows at Hermes, Gucci and other surrounding luxury goods purveyors, the atmosphere outside Grand Ocean, with its relative scarcity of luxury brands, was positively effervescent. Long known as "China's premier street," Nanjing's Xinjiekou shopping district boasts the highest number of department stores, shopping malls and hotels within a 300 meter radius of anywhere in China, a commercial density surpassing that of even Shanghai's Xujiahui district and Beijing's Wangfujing district. Every holiday weekend the area averages a million visitors per day. Xinjiekou is home to six department stores. Aside from Grand Ocean, others with operations across China include the Hong Kong-listed Golden Eagle Department Store, as well as domestic operators Dongfang (part of the Golden Eagle Retail Group), Nanjing Xinbai, Central Department Store and Deji Plaza. Although not comparable to the Golden Eagle Retail Group in terms of sheer scale, Grand Ocean's growth trajectory has made it the local standout. "I've worked for Grand Ocean for 10 years, and the word ‘decline' has never been in our dictionary," Lai says proudly. The store Lai oversees has continually posted annual sales growth of at least 30 percent. The impetus behind Lai's drive to continually strive to excel is an internal recognition mechanism to encourage competition among stores. Each night at 11 p.m. after leading the staff in ushering the last customer through the exits, Lai receives a text message on his cell phone. It's a message from Grand Ocean corporate headquarters sent to each of the group's 18 stores across China. It comes three times each day and tallies in real time the growth rate and achievement ratio of each of the 18 stores. "Numbers are the best management tool; they can help us improve ourselves and can serve as a platform to subtly nudge internal competition," Yan says with a satisfied laugh at the mention of the real-time reporting mechanism. "It is truly one of the greatest joys of the department store business. Lai opens the text message with great trepidation and after reading its contents finally breathes a sigh of relief. "We've held on to our top position today, let's get ready for tomorrow," he says, putting down the cell phone while already mulling over his latest "spend 500 get 200 free" campaign.